Home / Columnists/ Yahapalanaya in 2017: To be or not to be? Yahapalanaya in 2017: To be or not to be? Every year on 8 January, a quiet gathering takes place at a grave inside the Borella cemetery. Words are spoken softly about a life lived in glorious irreverence, a man remembered for his courage and capacity to inspire. Flower tributes are paid at his tombstone inside the tree-lined cemetery; memory sketches are drawn of an irrepressible spirit, ringing laughter and sheer cheek. For eight years, since his murder in 2009, this early morning vigil at the grave of The Sunday Leader Editor Lasantha Wickrematunge has become something of a ritual of the faithful. Strangers who never knew the man also turn up, reflecting a wider understanding about how his death had profoundly impacted freedom; how fear and oppression had taken over a nation. Mahinda Rajapaksa’s astrologers in their wisdom picked 8 January 2015 for the election that was supposed to usher in the former President’s unprecedented third term in office. As usual, the date centred on the magic number eight, the number that has determined election days in the last three presidential contests because it was Rajapaksa’s lucky number. It was a coincidence that Rajapaksa’s critics and dissidents seized upon early into the election cycle. The opposition coalition fielding Maithripala Sirisena, weak, impoverished and muscled out at every turn by the incumbent election machinery, had been gifted an unbelievable trump card. Opposition campaign advertisements featured heart-stirring music and lyrics that spoke of repression and revolution and visuals of Lasantha Wickrematunge’s bruised and bloody body, lying on a hospital stretcher. The message to anti-Rajapaksa forces mobilising across the country was clear – on the anniversary of Lasantha’s death, cast a vote against the brutal regime that presided over his killing. As that fateful election day dawned in Sri Lanka, the graveside vigil unfolded as usual. Organisers say 2015 saw a slightly bigger crowd. Perhaps the ritual took on a particular significance or poignancy as the country faced one of its most decisive elections that day. For a country that was staring down the barrel of authoritarianism for the foreseeable future, there was an inescapable poetic justice, and potential for catharsis and vindication in the coinciding of the two dates. Since 2015, two anniversaries have been commemorated on 8 January. This year, Yahapalanaya – the administration that defeated the Rajapaksa politics of nepotism, corruption and brutality – turned two on the eighth anniversary of Lasantha’s death. Each year, on the anniversary of its victory, the Government has flown down speakers to address audiences at the BMICH in Colombo to speak of hope and transformation in the post-January 8 era. During the commemoration this year, President Sirisena and Prime Minister Ranil Wickremesinghe highlighted progress made since they took office and chorused assurances about the Government’s stability. On the same day, a small crowd gathers at the graveside of the slain Editor. This year the grasses growing over Lasantha’s grave were disturbed. In 2016, forensic specialists exhumed his body, hoping a fresh post-mortem exam would help to nab his killers. That was three months ago. Since then, the only suspect in the murder, a military intelligence operative called Premananda Udalagama has been released on bail. The release followed a scathing attack on law enforcement by President Sirisena, who claimed intelligence officials – most of them remanded over attacks on journalists – were in remand for months without being tried. Sirisena’s speech was widely criticised as being a huge betrayal of his mandate to stamp out corruption and end impunity for crimes committed against journalists and dissidents during Rajapaksa’s tenure. The cases have seen no movement since. It is reasonable to assume that when politicians use victims of past abuses in their election propaganda, the their moral obligation to bring their killers and attackers to justice is greater. But two years since this Government was swept to power, partly on the strength of a collective clamour for justice and accountability, Lasantha Wickrematunge’s killers are still free. As the Government steps into its third year in office, most of its other pledges have also fallen by the wayside. Broadly speaking, beating rampant corruption in the political system, delivering on a political solution to the ethnic conflict and constitutional reform including the abolishment of the presidency were the three issues at the heart of President Sirisena’s mandate. Each of these pledges attracted different segments of society, creating a broad social coalition that brought about the fall of the Rajapaksa regime. In only two years, the Government has broken faith with all these constituencies, reneging on pledges to stamp out corrupt governance and deliver on genuine post-war healing that must include an honest reflection of the past. The Government’s democratic reform agenda peaked with the passage of the 19th Amendment, only three months into its term – and seems like a lifetime ago. Since then, moves to strengthen parliamentary oversight mechanisms and the enactment of Right to Information legislation have been the only bright lights on an otherwise bleak horizon of meaningful systemic reform. In sum, if it was still possible to believe in transformation at the end of the Sirisena-Wickremesinghe administration’s first year in office, the second year may be better remembered for how the Government took a sledgehammer to hopes for political system overhaul and prospects for a permanent peace. Two years into its term, corruption scandals, cronyism and a lack of transparency in its dealings plague the ‘good governance’ administration. The worst of these, involving a Treasury bond scam at the Central Bank when it was led by Governor Arjuna Mahendran has cast a long shadow, undermining the Government’s claims about a zero-tolerance approach to corruption. The February 2015 bond scandal has gone two years without credible investigation by the Government. Only Dr Indrajit Coomaraswamy who succeeded Mahendran as Governor of the Central Bank, has attempted to hold the beneficiaries of the allegedly manipulated bond transaction to account thus far. By all accounts, these attempts to check Perpetual Treasuries have angered senior members of the Government with alleged ties to the company and its controversial Director Arjun Aloysius, putting the new Governor of the Central Bank directly in their line of fire, both privately and in public. Attempts to hold members of the previous regime to account for corruption have become farcical, with endless rounds of arrests and releases and round-robin visits to the Financial Crimes Investigation Division (FCID) in Fort by members of the Rajapaksa administration. Politicians and officials still loyal to President Rajapaksa get thrown in jail on for on fraud and theft charges only to be released on bail a few weeks later, when they emerge from Welikada playing conquering heroes. With all the resources thrown at the investigating bodies, donor-funded capacity building and training programmes to bolster the investigation of financial crimes, not a single case has been built that will hold up in a court of law. The more solid cases, involving the former Governor of the Central Bank, Rajapaksa’s former Chief of Staff and a certain monitoring MP of dubious repute have seen no movement at all, amid speculation that each of these individuals has won immunity by building solid relationships with members of the current Government. 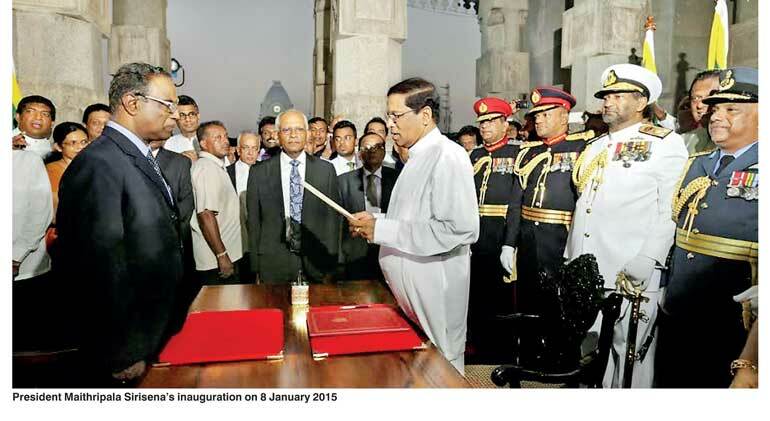 With many of the ministers who served in the former President’s cabinet also holding office in the Sirisena administration, interference into past corruption cases is also on the rise according to authoritative sources. Police investigators typically set aside the complaint halfway through investigation, until the “heat dies down,” the sources reveal. There is also growing suspicion of the UNP colluding to protect the former President, whose entire family is facing corruption investigations. The alleged moves have angered President Sirisena, who reads the strange alliance as an attempt to keep Rajapaksa in play as a political factor, in an effort to prolong divisions in the SLFP, giving the UNP an electoral advantage by default. In its second year, the Sirisena-Wickremesinghe administration also set about alienating ethnic and religious minority communities that backed the opposition movement pledging an end to racism and foster reconciliation in January 2015. Early into his term, President Sirisena claimed that he had an “obligation” to resolve the issues of the Tamil people, who had voted for him en mass at the presidential election. He also denounced extremist groups and distanced himself from the monk-led movements sowing fear and hate between communities, in response to the faith the Muslim community had placed in him in the electoral contest. These were progressive positions taken by the new Government, that had representatives of the Tamil and Muslim communities claiming that even if nothing else was achieved by the Sirisena administration, freedom from fear had been worth their vote against Rajapaksa in 2015. But more recently, the new Government – principally Justice Minister Wijeyadasa Rajapakshe – is offering the group immunity and the movement is flexing its muscles again with a series of rallies and eerily familiar anti-minority rhetoric. President Sirisena has also contributed to this resurgence, by meeting with the controversial BBS General Secretary Galagoda Aththe Gnanasara Thero together with other Buddhist monks. The Government is also actively working to anger the Tamils, a community that has borne the brunt of the war and embarrass moderate sections of the Tamil polity by going back on its transitional justice commitments. President Sirisena and Prime Minister Wickremesinghe have distanced themselves from a report by a Task Force it appointed to obtain the people’s views about how transitional justice mechanisms should be structured. Having received 7,306 submissions during the consultative process, the Consultations Task Force (CTF) on Reconciliation Mechanisms delivered its report to the Government on 3 January 2017. Among other things the report recommended a hybrid special court, comprising international participation at all levels, but including the caveat that this foreign involvement may be phased out once the court had won the trust of victims and built competence locally to deal with complex international crimes. Outside of this most controversial section, the CTF’s 500-page report reflects the views of Sri Lankans from every district in the island, regarding disappearances, immediate needs, socio-economic concerns and psychosocial healing. It is the first broad public survey conducted since the end of the war, or perhaps ever, about measures the Government should adopt to ensure meaningful peace-building. The response from the Government to a report it commissioned as a vital part of the process to design transitional justice structures it has committed to at the UN in Geneva, beggars belief. Several members of the Government, including the Justice Minister, who constantly finds himself on the wrong side of the reform agenda lately, denounced the report, saying it was compiled by NGO representatives and reiterating that foreign judges are completely off the table. Yet the “NGO representatives” on the Task Force – which was entirely civil society led – were appointed by the Prime Minister of the Government Rajapakse serves. The outbursts lay bare rampant dysfunction within the Government and seriously erode confidence in the administration’s commitment to deal credibly with the legacy of a long and brutal civil war. All this leaves thousands of war-affected Tamil people still grappling with rebuilding lives torn apart by conflict, still on an endless quest for justice, high and dry. Human rights activists and groups working with war-affected communities are beginning to resign themselves to the fact that this attempt at dealing with the past through meaningful transitional justice processes is drawing to a close. This has been a trend in many countries recovering from conflict and turmoil, where transitional justice is achieved in incremental waves, whenever the political moment presents itself, sometimes over decades. Over the next few years, several activists are likely to focus on preserving their work – including the CTF report – for posterity, hoping that when Sri Lanka’s next best moment for reckoning with an ugly past comes along, groundwork is available to build on. Initially the Government’s stated commitment to drafting a new constitution allowed countries pressing for justice for crimes committed during the war in Sri Lanka to back down temporarily. The Tamil National Alliance also prioritised the constitution-making process, focusing less on war crimes accountability while drafting was underway to give the process its best possible chance at success. Disregarding all this, members of the Government, particularly the SLFP, are growing increasingly vocal in opposition to a new constitution and power sharing arrangements that go beyond the 13th Amendment. This week, the SLFP which has agitated against the executive presidency since it was established in 1978, claimed it was not in favour of abolishing the presidency, and insisted it would field President Sirisena as its presidential candidate in 2020. The SLFP Central Committee decreed that a referendum on a new constitution was also off the table. Without a referendum, the Government could only enact constitutional amendments using its two thirds majority in Parliament and would fail to deliver on fundamental reforms that would expand power sharing arrangements with the periphery that must be approved by people at a referendum and a pre-requisite of any long-term political solution to the ethnic conflict. According to SLFP Ministers, President Sirisena had not uttered a word at the Central Committee meeting while the resolutions were being passed. Even UNP Ministers are profoundly wary of going before the people at a referendum, preferring not to turn the constitutional reform process into an electoral contest. So early in 2017, the year that was supposed to see the realization of major Government pledges, including a new constitution and abolition of the presidency is looking more doubtful than ever. President Sirisena, it was loudly proclaimed on the campaign trail, would be the last executive president of Sri Lanka. In November 2015, standing before Sobitha Thero’s funeral pyre, President Sirisena vowed to fulfil his ultimate wish and abolish the presidency. Sirisena loyalists like Rajitha Senaratne have insisted that the President remains committed to abolition, despite SLFP claims. But the presidency has a long history of proving too alluring to resist, and Sirisena is no less vulnerable to its charms. There is a reason that the failures of this Government bring such deep disappointment and disillusionment. The 2015 presidential election is celebrated as a transformative moment in the psyche of the electorate and the history of politics in this country. When it campaigned to win office, the opposition relied on something more than just ordinary election slogans; slogans that went beyond ‘rice from the moon’. For the first time the opposition campaigned on an idea; an idea that lit the public imagination because it centred on repairing a system that had been broken for generations. But two years later, spectres from the past continue to haunt the system. True reformists are in a minority. The old guard still wields control, and it only knows to govern in the old, broken way. A broad people’s coalition, united only in some shared values, gave the Sirisena-Wickremesinghe combine a phenomenal, against-all-odds victory in 2015. Soon after the election, the time was ripe to expand that coalition. The mood in the country had altered, from triumphalist and fearful, to hopeful and conciliatory. Had the Government exploited that democratic space to pursue truly transformative policy with regard to peace-building and systemic reform early in its tenure, Sri Lanka’s democratic landscape would look very different today. If it had moved faster to check corruption in its ranks and championed reconciliation and justice, the future would look a lot less bleak and fraught with less political risk than it does today. Today, the Government runs scared of a referendum, not because it fears people will reject a new constitution, but because it has ceded too much ground on other issues including corruption and bad economic management. Its multiple failures have created a political space that is ripe for exploitation. A nationalist mobilization is underway, only two years after the politics of hate, fear and ethno-religious supremacy was defeated. And a former President is waiting in the wings to reap the benefits of that resurgence. That prospect is truly terrifying. So while the future may look bleak, the reformist constituencies that hitched their wagon to Yahapalanaya has no choice but to stay engaged with this Government, to find ways to keep influencing policy and pressing for reform before the window closes forever. 8 January was a people’s triumph; and only continued public engagement in governance and reform can keep the transformative power of that victory alive. As for the Government, with three years left in its term, 2017 can be one of two things. It can be a year to attempt course correction, strive to restore public confidence and summon the courage and moral fortitude to champion unpopular causes that will lead Sri Lanka into an age of lasting peace and prosperity. Or the Yahapalanaya Government can allow the rot to set in, as it hurtles along this path towards self-destruction, setting itself up for monumental defeat in 2020.